Imbalance: An imbalanced hoof causes the horse to bear more weight than it should on part of the foot, and the greater load means that area is coming down harder than normal on whatever it encounters on the ground. Just the weight of the horse can be enough to cause bruising if the imbalance is bad enough, as is often the case with heel bruises that result from long toes and underrun heels. Thin soles: Even a horse with thick, tough soles can get the odd stone bruise. However, when the sole is thin, the blood vessels are already under stress, plus they are just that much closer to all the things the foot has to travel over. Working to ensure that your horse has adequate depth of sole, and avoiding any paring or thinning of the sole is an important part of protecting against sole bruises. 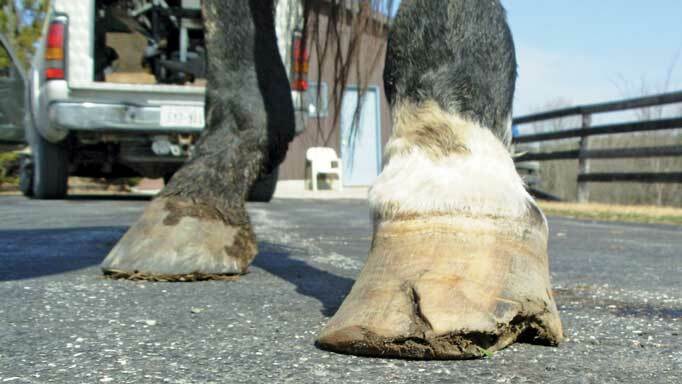 Shoeing/trimming issues: Poor (or overdue) shoeing or trimming can cause or contribute to bruising by creating imbalance, contraction and other issues. 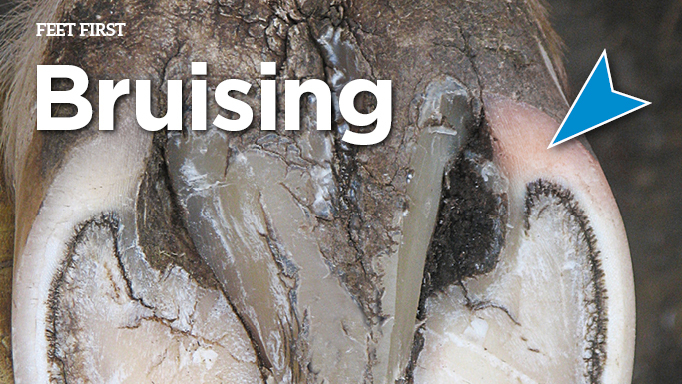 Hoof conformation: The shape of some horses’ feet makes them vulnerable to bruises. For example, flat feet are more prone to bruising on the bottom of the foot, while feet with long toe/low heel conformation are at increased risk of both heel and white line bruising. Contraction: Whether caused by poor shoeing or other issues, contraction compromises circulation and puts pressure on the structures in the back of the foot, both factors that make bruising a more likely occurrence. Terrain: Hard, rocky ground makes stone bruises more likely for any horse, but horses kept in soft footing and then asked to head out on rocky trails are especially at risk. Such horses should be given extra protection in the form of pads (if shod) or hoof boots (if barefoot) before being asked to work on rough footing they are not accustomed to. Concussion from working on hard surfaces like packed dirt or paved roads can also lead to bruising, especially if the horse is asked to do much trotting or cantering. Environmental conditions: Exposure to moisture softens the sole, which increases the chances of bruising in two ways. First, just being soft makes the sole less able to protect the foot, but a soft sole also wears away more easily, so it can become thinner. Ice and snow can be an issue as well, as they not only create hard, lumpy ground, but can also pack into the bottom of the foot, negating the foot’s natural concavity and filling it in with hard material. A note on man-made environmental problems: standing in muck and urine weakens the entire hoof but particularly the sole, leaving the foot more likely to bruise. Weight and hoof size: The weight of the horse in relation to its feet can play a part in how likely that horse is to get bruises. 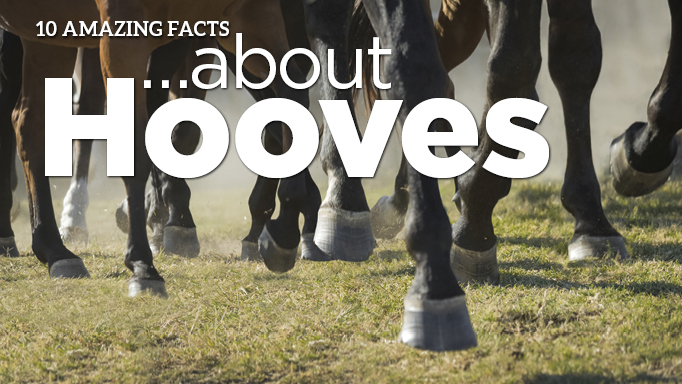 Heavy horses tend to have flatter feet, giving them less clearance when they step on a rock or whatnot. And, when a horse is heavy but has small feet for its size, the pounds per square inch of pressure exerted every time those hooves touch the ground can be enormous. As for treatment, most bruises don’t cause great discomfort and will heal on their own as the damaged tissue grows out. However, if you are dealing with a severe bruise, the horse may require rest, and pain relief can be provided through icing and the use of non-steroidal anti-inflammatory medications such as phenylbutazone (“bute”). Protection in the form of pads or hoof boots may also provide some relief from pain and could help prevent future bruising, but be aware that these can make some already bruised feet more uncomfortable, not less, so you want to be attentive to how your horse responds to them. You will also want to check the bruised area for any fissures or cracks that could admit bacteria and potentially lead to an abscess. But regardless of whether you see any external openings, be watchful for the signs of abscessing, as they can occur after a bruise even when there is no external pathway for bacteria. The best strategy in the fight against bruised feet is to be aware of the issues that can leave your horse more likely to sustain bruises, and do what you can to prevent those problems. As always, a healthy, balanced foot is far more able to cope with whatever it encounters, so good nutrition and good hoof care are your perpetual allies. 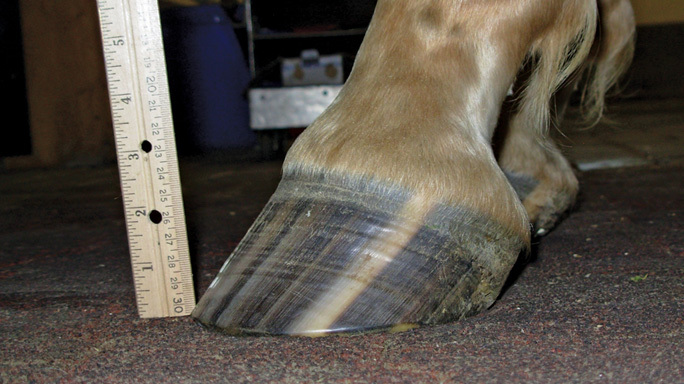 Nutrition notes: Can diet affect hoof health? Q - My horse's hooves are always cracking. What can I feed him to prevent this? 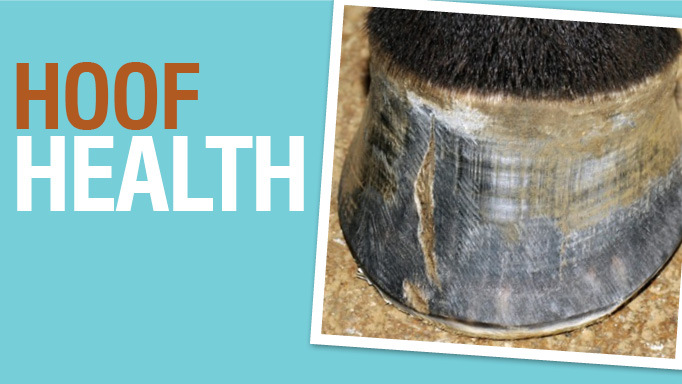 10 things you might not know about the intricate and complicated equine hoof.